I chanced upon Hemoglobin some years back, rented it on a whim and found it to be watchable. Some of the scenes can be a little disturbing, if you'll leave a good portion of disbelief at the doorstep. The lighthouse scene near the end can be particularly upsetting, I found. Sometimes certain movies just influence some people more than others. Back when I rented Hemoglobin, I also met a Polish acquaintance at the video store where a friend and I were browsing and subsequently rented Hemoglobin. The Danish translation was 'Urent Blod' (Unclean Blood), and our Polish acquaintance, who is really a great guy, not a native Dane nor too familiar with our language, exclaimed loudly, upon seeing the title: 'Urrent Blood! ', in an English accent, and that left us all in stitches, him too after we explained it. I'm not sure what an 'Urrent' is either. We then turn the cover over and notice the original title, upon where our Polish friend loudly says: 'Hemogoblin!? ', causing stomach cramps all 'round. The last Lovecraftian film I watched was The Orphanage. It was Lovecraftian in that it was a portrait of a woman's descent into madness and was set near an ocean. No tentacled beasties, though. I was under the general impression that HPL was not a habitual user of drugs and thus was not writing under such a stupor, but rather that he was plagued (blessed?) with nightmares, phobias, and an extremely bizarre youth and life. I'm not sure whether you could honestly call The Red Shoes a Cthuluoid movie, as it lacks a lot of the elements that might be considered traditional HPL trademarks. However I rate it highly, as an exploration of madness - particularly as you get closer to the end. It's a tricky one. There's a lot of elements that could be considered formulaic, and it's fair to say that it nicks a few plot ideas from Dark Water, (which on the whole is probably the better movie). What held it together for me was the central character; but I can't say too much more without giving away large chunks of plot. That's never a good thing to do. I watched Romero's "Dawn of the Dead" and "The Host" over the weekend. I loved both very much. DidnÃ¢â‚¬â„¢t quite get the connection between the title of the movie and the movie itself though. Science fiction book club. Andrew Wheeler. H.P. Lovecrafts' Black Seas of Infinity. This man is an editor at the SFBC. H.P. Lovecraft 1890-1937. Died from intestinal cancer. Was taking opium for pain, hence the wild dreams and hallucinations. This is something I know is true, but I cannot seem to find the part in the book that explains it all exactly. H.P. 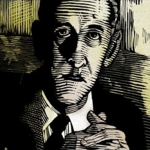 Lovecraft is the best known and most studied American horror writer of the early 20 th century. His influence on the field is still felt today. more than 60 years after his death. He lived and worked primarily in Providence, Rhode Island, and prided himself on his aristocratic lineage. He was a major force in amateur journalism and a tireless correspondent, whose selected letters equal his published fiction and whose total letters dwarf all else that he wrote. he was, in all his idiosyncratic, crotchety glory, a true American original. I watched John Carpenter's Prince Of Darkness the other evening (with my love). Now, he has directed 3 of my most-loved films (The Fog, The Thing, Halloween), but it certainly wasn't in their league. The central idea is quite Lovecraftian - the 'scientising/materialising' of the Christian mythology, and claiming that all this talk of spirits/souls/angels etc. was really guff made up for silly/gullible people, and in fact, the real bad thing is simply some strange, developing, gloopy stuff which wishes us all unwell, something distinctly material (and what that means exactly is of course another question). It has its moments, and the soundtrack is a nice piece of Carpenter apprehension-building, if not especially memorable. The commentary on the dvd by Carpenter (and pal) is amusing and occasionally interesting - though he doesn't remember too much about it at times, and doesn't have much more idea of what is going on, or has happened, 'outside the camera frame', so to speak, than you or I. A film set free into the wide open seas of hermeneutics by the author (who we all know is dead anyway, as various scintillating French thinkers informed us in their 60s writings). Also still enjoy on re-watching: the Babylon 5 movie Thirdspace, which is Lovecraftian in both plot premise and monster shape -- though it really helps to be familiar with the TV series, as that established the setting and characters. B5 has dipped into the horror genre repeatedly, as in the movies River of Souls and (first half of) The Lost Tales. Not quite Lovecraftian (except for being horrifying, like Prince of Darkness or the Hellraiser films) is another spacefaring movie, Event Horizon. The concept of another dimension containing hellish perils would be the commonality here. Beyond the walls of sleep (?) - Not perhaps the best movie ever, a bit gory too, but it's so strange and alien that I found it quite scary all the same. The music of Erich Zann - Great short movie (german or french, can't remember). Very nice atmosphere and follows the original story closely. Dreams in the witch's house - Awesome! Freakish, scary and close to the original. The Call of Cthulhu - I liked it, although it's perhaps not too great as a film in itself. Highly recommended though. Dagon - A bit "Scream" in my opinion, but nice all the same. The Dunwich Horror I saw a couple of years back. Very psychedelic. The movie is quite bad and the special effects are mostly poorly done. The intro is quite good though. Waiting on Netflix to deliver the "Bonus Disc" version of The Mist. If you have Netflix and have not seen "The Mist" yet, make sure do get the Bonus Disc, not the main movie. The Bonus has the (preferred) black and white Director's cut version of the movie on it. Sadly I have a pile of Lovecraftian films to watch, but since they were gifts to my girlfriend and she still has not watched them, I am not in a position to do so. Oh, someone else mentioned EVENT HORIZON which in many ways was close to being a classic horror film, but sort of drops the ball by the end and falls short. However, if you like horror in space i would still recommend Event Horizon. It deals with otherwordly dimensions. I've mentioned Event Horizon multiple times. It's essentially Hellraiser in space. I've read rumors that it was supposed to be Warhammer 40k the prequel movie. Any of you crazy kids going to go out and watch "The Ruins"? Though the commercials make it look like generic schlock horror fare, I hear it's actually garnered some pretty good reviews, so it might have hope. Death Tunnel - Not the best movie perhaps. Maybe even, dare I say, c**p, but it could still give some decent scenario-ideas. The Host - Notable for the insane reaction of the authorities i.e. drilling the skull of a living subject to look for a non-existent virus, all to keep up the cover story! A highly-recommended monster movie. The other is "Insanitarium", about a dude who pretends to be insane in order to get comitted to an asylum where his insane sister is held in order to "rescue" her. But once inside, he finds out some nasty experiments are going on, and that he might actually be insane/. I finally got around to seeing Herbert West: Reanimator. Gotta say in all honesty, I didn't much care for it. Oh well. I only spent $2 on the DVD (including a neon green highlighter shaped like a syringe: sure to be a prop come Halloween-time). A coworker just lent me The Dunwich Horror. So I'll be watching that soon! Cloverfield was fun. I enjoyed it, and after finding out the nature of the beast via the commentary (though I knew it from the post-release interviews), I took all of the beast's actions into a completely different light. I don't know what "plot holes" some of the complainers were complaining about. The wife tried to watch it, but got ill right at the start of the Brooklyn Bridge scene near the beginning due to shaky-cam syndrome combined with her inability to be on a boat for more than 1 minute without the old heave-ho. I've now seen Dead Birds, mentioned earlier in the thread, and it certainly has its moments. Ultimately its not a great film because it doesn't know what to do with its characters. It's sort of a Civil War set TPK. I think, as written, there's probably a lot more HPL than made it to the screen. And I'll also echo Ramsey Campbell's opinion that The Blair Witch Project is quite a good Lovecraftian film as well.